Total Guitar 255 on sale now: Led Zeppelin & the riffs that changed rock 'n'roll! Total Guitar issue 255 is available from today in print in the UK and digitally worldwide. CLICK HERE TO START A FREE DIGITAL TRIAL SUBSCRIPTION TO TOTAL GUITAR ON iOS, ANDROID, PC/MAC, KINDLE FIRE AND MORE! 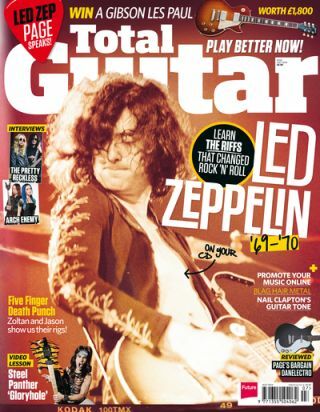 Total Guitar 255 is out now, and this issue we're celebrating Jimmy Page's guitar playing on Led Zeppelin's first three albums. As well as the story of Led Zep I-III and an interview with Jimmy himself about the recently reissued albums, we've included 10 video lessons of the best riffs from I-III on your CD. Plus, win a Gibson 2014 Les Paul Traditional!